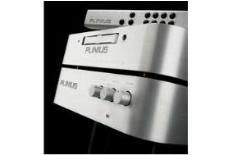 Plinius CD-101 review | What Hi-Fi? Plinius is a name barely known in the UK. That's a real shame because this New Zealand-based electronics manufacturer has been established since 1980, and judging by this CD player/integrated combo, it's a company capable of making the best hi-fi around. Simplicity is Plinius's watchword, and you can't get any simpler than a CD player with only one front-panel button and no numerical display. To do anything other than stop or load – the one button does both jobs – you'll have to use the remote handset. And what a handset it is. Most rival manufacturers make do with cheap, plastic, off-the-shelf units that look and feel no better than those found on a supermarket-special DVD player. Plinius, in contrast, has gone to the trouble of making a chunky, metal design that looks great and is very easy to use. Both the CD player and amplifier come with dedicated handsets, although you don't really need both because the one supplied with the CD-101 includes volume, too. The simplicity extends to the disc spinner's circuitry, where the company ignores the current fashion for up-sampling and flashy DAC configurations for the rather basic option of a conventionally over-sampled multi-bit conversion. Of course, you can be sure the engineers put in a great deal of effort to ensure the implementation was spot on. It's similar to the method employed by Naim, which prefers to stick to well-implemented older technology rather than trying to impress with cutting-edge specifications. The lack of a proper display might appear to be a problem, but get used to the CD-101's simple – there's that word again – LED arrangement and you won't really miss it. The 9200 integrated amplifier is right on message. It's easy to use while having enough features to keep most purists happy. There are plenty of inputs, even a phono stage, and the option of both balanced and unbalanced connections. A power output of 200 watts per channel means this amplifier will be happy driving most price-compatible speakers to decent levels in most rooms. Not something that can always be said about lower-powered alternatives. Outwardly, there's little about the CD player or amplifier that suggests any thing beyond the norm at this kind of price level. Start listening, though, and we doubt you'll want to stop. Both individually and as a pairing, this kit is as musical as hi-fi gets. The sonic character of both is the same, which suggests a consistent engineering approach was applied to both. These are fast and punchy-sounding components and they latch on to a rhythm track with the determination of a Terminator tracking its victim. Play something like The Red Hot Chili Peppers' By The Way set and they power through the tracks with unbounded energy – you couldn't reasonably ask for greater punch or drive. The sound is underpinned by taut, articulate low frequencies that go deep, loud and stay true. The Plinius pair sounds dynamic, punchy and massively enthusiastic with upbeat music, yet feed them something requiring finesse and they'll change attitude in an instant. Mahler's 10th Symphony is delivered with more than enough insight to get right to the heart of the music. Sound staging is precise and the balance is well-judged. High frequencies have a rare brilliance that could, if partnered with overly bright speakers, err towards excess. But match with just a little care and it won't be a problem. We can't recommend this Plinius pairing too highly. Individually, they are right up there with the very best at their price level; as a combination, they're pretty much unbeatable for the money. Matched with good speakers we reckon you'd have to spend double the six grand price tag to get something appreciably better. That's what makes them a bargain.